We had a second ultrasound a little over a week ago to see the newest babe and everything seems to be growing just as it should! Measuring right on track and could very clearly see and hear the heartbeat this time. 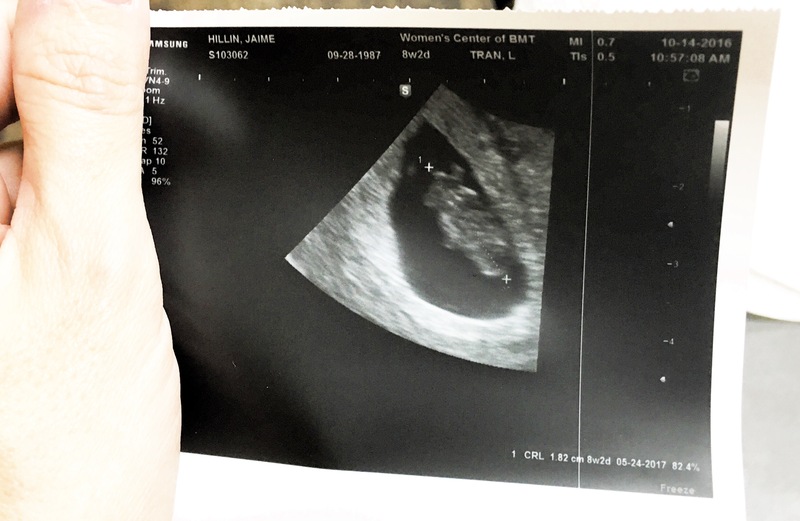 It’s so crazy to see how small it is at an almost 6 week ultrasound vs just over 8 weeks ultrasound. Baby’s heartbeat at the first ultrasound was 120 and at the second was 163 I believe. Whitlee’s heartbeat at 8ish weeks was 182. We can’t wait to find out if there’s a baby brother or baby sister in there! Gender Predictions: I have the worst intuition because I really thought Whitlee was going to be a boy, so I can’t even guess. I’ll just tell a little about our gender reveal plans instead. With Whitlee, Nolan and I found out her gender during the ultrasound and then told our family and friends during the party with the balloon pop (video here). This time, we’ve decided to go the traditional gender reveal route and we’re not finding out the gender until the party with everyone else! I’m so excited! 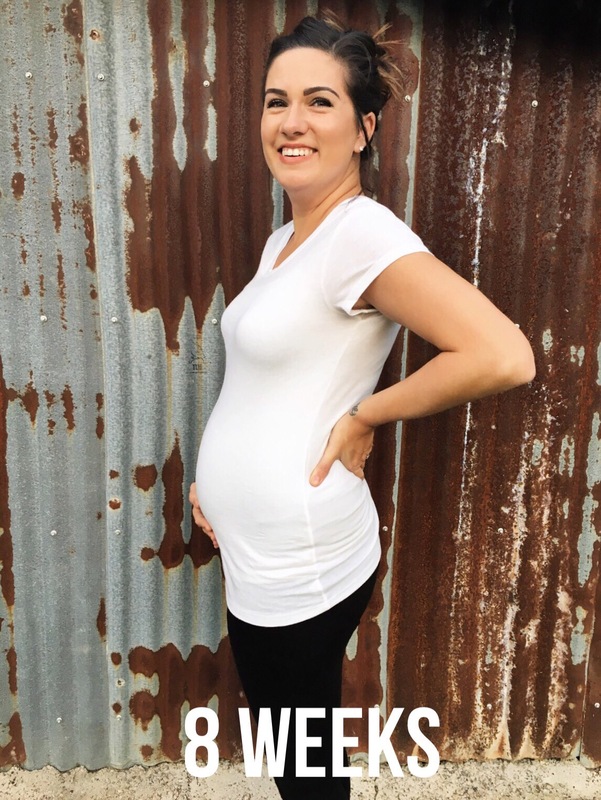 Maternity Clothes: I’ve definitely worn a few items already. Sleep: Still extremely tired. And still random bits of insomnia. If I wake up in the middle of the night and have to do anything more than just zombie walk my way to the bathroom and back, then I’m awake for a good hour or more before I can go back to sleep. 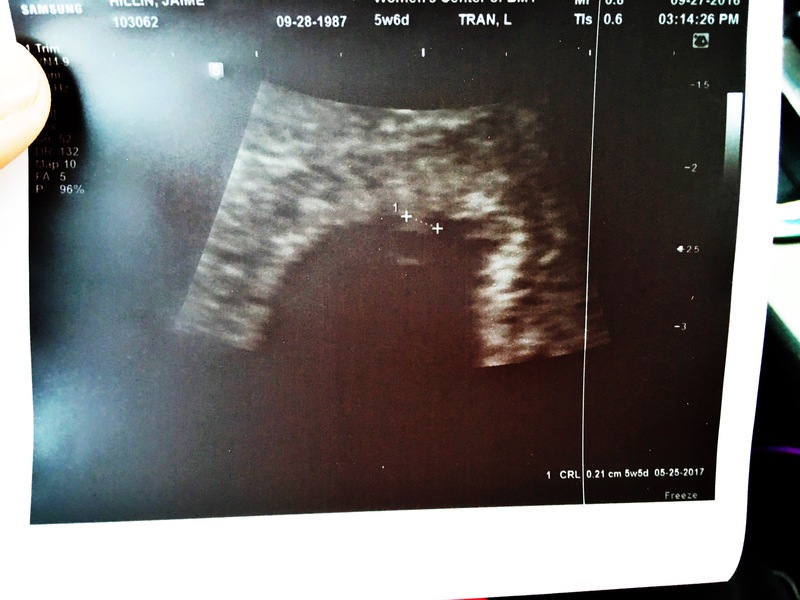 Best Moment The Last Few Weeks: Our doctor is monitoring me very closely and doing a lot of early testing and I mentioned in our last post that we got to have an ultrasound already. I had it at 5 weeks 6 days and it was basically to confirm pregnancy and get a dating. The tech let me know that seeing a heartbeat this early was about 50/50 and made sure I knew not to be alarmed if we couldn’t see a heartbeat yet. But she zoomed in and the sound came up and there it was! Such a sweet sound. Miss Anything: I’m gonna go with “people minding their own business”. I forgot how much people like to comment on your size or what you’re eating, drinking, doing, wearing, etc. Cravings/Aversions: Craving tomatoes/tomato juice, watermelon, and salad. Aversions to chicken and maybe cheesecake? Symptoms: Not too many this go round. Just really tired and some mild nausea in the evenings. I’ve actually felt pretty good! Additional Notes: I did my 24 hour urine collection this past weekend so that they have base levels of how much protein I normally carry in my urine. My blood pressure has been okay, not as great as it was this early with Whitlee but still okay. I have another ultrasound this Friday and I’m super excited to actually see the baby a little better. We should find out the gender the beginning of December and I’m pretty sure we’ve decided on a name either way. I feel like it’s going by a little faster than last time for some reason but there’s also a little less to like super prepare for. We basically still have everything from Whitlee as a baby so we shouldn’t need very many big items. I’m sure I’ll still be buying adorable outfits though and I already have my eye on some very cute bedding either way on gender!